If you’ve ever been a morning person, you know what comes with that territory: someone around you–sibling, parent, roommate, friend–will scowl at you as you come skipping down the hall for breakfast. I lived with the same people for the last three years of college and they will be the first to tell you that I am entirely too happy in the mornings. There are a few exceptions to this rule. I really, really didn’t want to wake up today. I screwed my eyes shut and tried everything to get those last few minutes in before my alarm started sounding at me: I curled into a ball; I stretched my legs out straight; I sprawled across the entire bed and left no room for anything, not even the pillows. Nothing doing. It was almost 7AM and I was wide awake (despite the closed eyes). The last time this happened, I was moving out of my dorm room for the last time ever on the day after commencement. On that morning, I refused to roll out of bed. Nobody else was in our apartment; it was just me, some boxes, and empty rooms. I quite literally refused to get out of bed: NOPE, I said to the quiet morning. Not yet. Was that really only two weeks ago? Of course, that technique didn’t work particularly well at that point, either. Eventually, I dragged myself out of bed and finished packing my things. Today was similar, but kind of the reverse of last time this happened. Last time, it was an ending. Today, it’s a beginning. My first day of work starts in one hour and I have curled myself into this chair with a rather large mug of Earl Grey (from Dublin, naturally) clutched in my hands and as I try to breathe regularly and not have an emotional breakdown. Some people don’t like endings, but for me–endings make sense. I understand them to a certain extent. Now, beginnings, on the other hand–beginnings are a bit scarier. The unknown. The possibilities. The future. See, endings are about the past–things that have already happened coming to a close. Beginnings are about what’s next, and the first of any series of events in which I’m expected to participate leave my stomach in a knots: my first swim meet when I was seven. My first day taking the M4 to school by myself. My first time working at camp. My first day of high school, of college–or, today, of work. I’m starting my “9 to 5” today, my first foray into the adult working world with an office job and a packed lunch and a brand new, working professional outfit (and shoes). … I’m a little freaked out (and not just because I have to leave in fifteen minutes and I’ve yet to actually pack that lunch). But you know what? That’s okay. I’ve never done anything like this. Seeing as I want to go to medical school in a few years and write novels in my free time, I probably won’t do anything like this again for quite a while. I graduated from college exactly two weeks ago today. It’s a sometimes-used tradition to decorate your graduation cap–for yourself, yes, but also to help your parents & friends recognize you from great distances. There are a lot of HAIL, ALMA MATERs and initials and the architecture majors all have these really cityscapes on their mortarboards (which is a term I learned only about… two weeks ago). Basia and I, we went with words. Hers was a quote from Welcome to Night Vale: the future always flinches first. ’cause we’re all just stories in the end. So here’s to stories. Here’s to early mornings and begrudging mornings, to packed lunches and the normality of a nine-to-five. Here’s to no homework, to reading for fun, and to actually writing that novel I keep saying I’ll get to eventually. Because, honestly, this is terrifying. It’s brand new to me, and that makes it unknown and more than a little scary. There’s nothing wrong with being scared a little bit– as one of my favorite authors would say, it means you’re paying attention. Do you know what I put on my mortarboard? Not a song lyric, or a platitude about moving on with life, nor even an inspiring Night Vale quote like Basia’s–no, I’m an old-fashioned girl at heart. Me? I turned to Lord of the Rings. 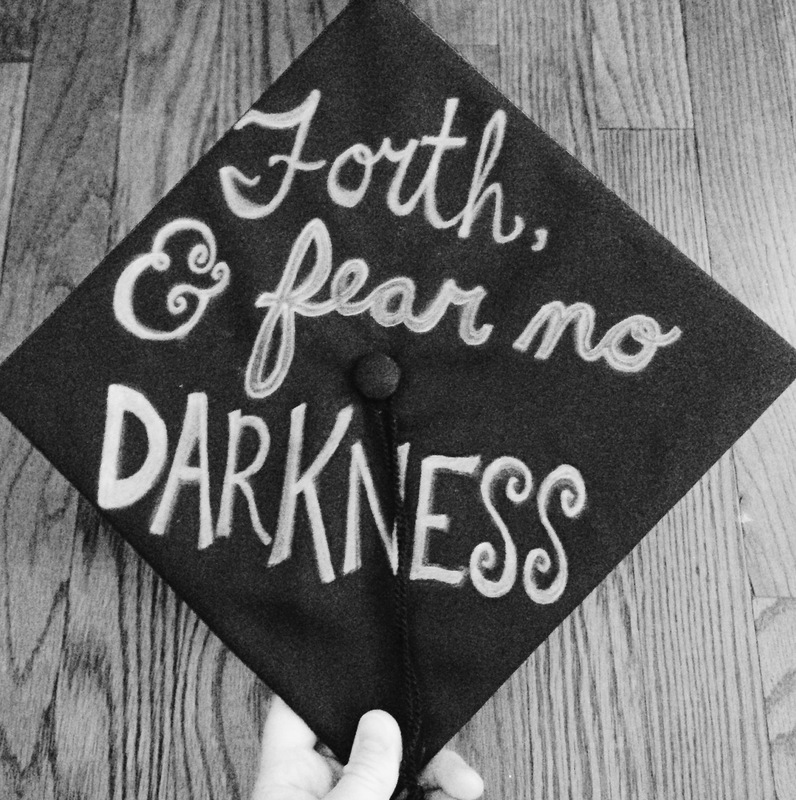 Forth, and fear no darkness. This entry was posted in the life and times, trying on adulthood and tagged beginnings, change, college graduate, new beginnings, new job, nine to five, post graduation, post graduation plans, work by connor grace. Bookmark the permalink.